Dr. Garret Stuber was accepted into the American College of Neuropsychopharmacology (ACNP) as an Associate Member in December 2011. Dr. Stuber earned his Ph.D. degree from University of North Carolina, Chapel Hill, where he trained in the laboratory of Drs. Regina Carelli and R. Mark Wightman. There, Dr. Stuber learned how to record dopamine signaling in a sub-second manner using in vivo voltammetric recordings. Coupling this procedure with intravenous cocaine self-administration in rats, Dr. Stuber published extensively, including highly cited papers in Nature, Neuron and Neuropsychopharmacology, on the temporal dynamics of midbrain dopamine signaling associated with distinct aspects of drug-seeking and drug-taking behaviors. During his post-doctoral training with Dr. Antonello Bonci at the Ernest Gallo Clinic and Research Center in San Francisco, Dr. Stuber contributed to a series of papers published in Science and Nature and other high-profile journals. A particularly important contribution was his description of the fact that reward-predictive cues can trigger plasticity in midbrain dopamine neurons. This observation may help explain how the brain processes environmental information necessary to guide behavior and thereby maximize the likelihood of obtaining appetitive stimuli necessary for survival. As such, these findings help explain basic aspects of how the brain learns new information. During his post-doctoral training, Dr. Stuber also took the opportunity to receive training in the optogenetic procedure by collaborating with the laboratory of Dr. Karl Deisseroth. Dr. Stuber contributed to some of the early, and now seminal, work in optogenetics and motivated behavior. In particular, Dr. Stuber co-authored the paper in Science showing that phasic dopamine firing was necessary for behavioral conditioning. Dr. Stuber has since emerged as a leader in applying optogenetics to better understand the neurocircuitry of motivated behaviors and addiction. 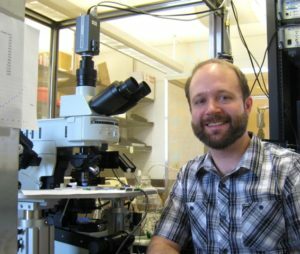 For example, Dr. Stuber recently published a first-author paper in Nature showing that amygdala inputs to the nucleus accumbens can facilitate reward-seeking behavior. An important feature of this paper is the demonstration that delivery of viruses to express light-sensitive channels into cell body areas (e.g., amygdala) can result in axonal and terminal expression of the channels such that afferent inputs from these cells can be modulated in a light-sensitive manner in projection sites (e.g., accumbens). Hence, Dr. Stuber’s paper demonstrated the power of the optogenetic procedure for mapping functional connectivity between various brain circuitries and their contribution to different behavioral states. Since establishing his own laboratory, Dr. Stuber’s research has continued to focus on delineating the synaptic mechanisms and neural circuitry underlying addiction and psychiatric diseases. Currently, his laboratory is investigating how perturbation of specific neural circuit elements can alter adaptive and maladaptive behaviors using cutting-edge techniques both in vivo and in vitro.